Badger Magnetics designs and manufactures resistance sensing relays for a wide variety of industries. Badger Magnetics’/Mag-Con Engineering’s custom resistance sensing relays are completely solid state except the electro-mechanical power relay if specified. The resistance sensing relays are electrically operated switches, sensing the presence of moist solids, slurries, chemicals, liquids, water and ice in a protective control system. The resistance sensing input circuit is isolated from other circuitry. 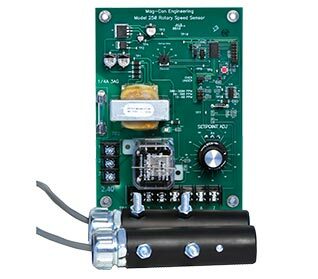 Resistance Sensing Relays are used in the following industries: storage tank level controls, sump pump controls, ice bank controls, feed water controls, livestock feeders, protective control systems, alarms, interface and more. Badger Magnetics designs and manufactures rotary speed sensors for a wide variety of industries. When the detection of overspeed or underspeed condition is paramount in rotary machinery, Badger Magnetics/Mag-Con Engineering has the manufacturing expertise for design specifications. Our unique magnetic “Mark” rotary speed sensors system allows reliable operation in adverse conditions. Caustic environments such as dusty, greasy, metal particles, moisture or snow will not inhibit accurate operation of the rotary speed sensor. 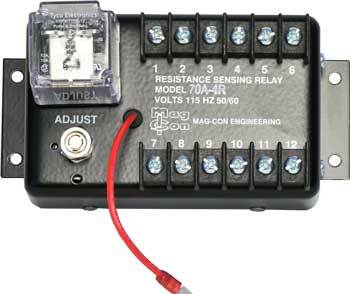 Badger Magnetics’ sensing head can be placed as far as 1,500 feet from the control board.